Time and time again, Christians set out to change their actions though resentful that they have to or many times they think they cannot change. Many feel like they have no control over themselves. “This is who I am.” “I cannot change.” “I was born this way.” The world makes claims like this all the time. “I can’t control my desires.” Those asserting such statements are most likely referring to the works of the flesh such as “adultery, fornication, uncleanness, lewdness, idolatry, sorcery, hatred, contentions, jealousies, outbursts of wrath, selfish ambitions, dissensions, heresies, envy, murders, drunkenness, revelries, and the like” (Gal 5:19–21). By the Spirit, Paul presented this struggle in Romans 7:15–25. Paul expressed, “For that which I do I know not: for not what I would, that do I practice; but what I hate, that I do” (Rom 7:15).This struggle is common to everyone. This comes down to the mind and thoughtful prevention. Not the conviction that these things are wrong or that you are tempted, but the discipline of the mind and constant prevention of such temptations. Paul declared, “but I see a different law in my members, warring against the law of my mind, and bringing me into captivity under the law of sin which is in my members” (Rom 7:23). This is the war and most are not armed. How can someone overcome these temptations? In Romans 8, the Spirit reveals that the mind that is set on the things of the Spirit is life and peace while the mind of the flesh is death (Rom 8:5–6). The mind must be set on the Spirit. This is certainly a life and death situation for “for if you live after the flesh, you must die; but if by the Spirit you put to death the deeds of the body, you shall live” (Rom 8:13). By setting the mind on the Spirit, the Spirit and Christ dwell within the believer (Rom 8:9–11). 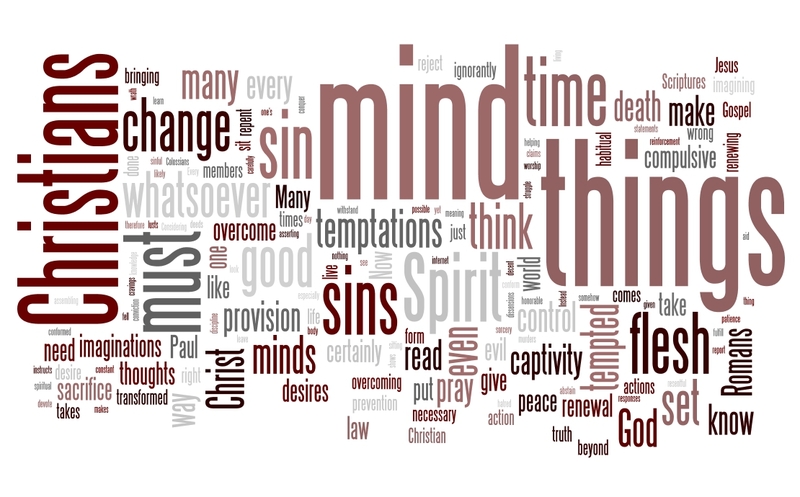 Setting the mind is not easy for many who struggle with sin. Many have just given up. The Scriptures continue to reveal the same truth for a need to change the mind. Every Christian must learn to change their mind. In Romans 12:1, Paul commanded that Christians give a sacrifice to God of their bodies as a living sacrifices as holy and pleasing to God. As for this sacrifice, Paul urged, “Do not be conformed to this world, but be transformed by the renewal of your mind” (Rom 12:2). How do Christians not conform and be transformed? This is done by renewing the mind. The mission of the Holy Spirit is transform us into the image of Christ (2 Cor 3:18). For Christians to overcome all sins, each person must change our mind. This is the literal meaning of the Greek word metanoia translated as “repent” (Acts 8:22; 2 Cor 12:21; Heb 6:1; Rev 2:5, 21–22). Christians must take time to think about the evil of these temptations, how these tempting sins are wrong and a misuse of the desires that God has given each person. Every desire has a good use. For instance, sexual desire is good for marriage and not outside of marriage. Everyone wants love and respect, and each has the responsibility to attain such in the right way. Christians are to take time to read and pray. Who takes time to repent? Repentance goes beyond being one of the first necessary responses to the Gospel of Christ (Acts 2:38; 17:30). In the renewal of the mind and thinking in the Spirit, should not the Christian take time to accomplish this? Why not think upon Christian ideals from reading and reflect through prayer to change one’s mind? How many Christians imagine themselves overcoming sin, helping others, and spreading the Gospel? This would certainly be the mind set on the things of the Spirit: love, joy, peace, patience, kindness, goodness, faithfulness, gentleness, and self-control. Paul instructed, “If then you were raised with Christ, seek those things which are above, where Christ is, sitting at the right hand of God. Set your mind on things above, not on things on the earth” (Col 3:1–2). Many devote their minds to sin even ignorantly calling evil good and good evil. Many spend their time listening to music, casual talk, and other forms of entertainment that romanticize evil. To conquer those habitual sins that continually rise up, Christians must keep good resolutions on the mind. Paul urged Christians to contemplate, “whatever is true, whatever is honorable, whatever is just, whatever is pure, whatever is lovely, whatever is commendable, if there is any excellence, if there is anything worthy of praise” (Phil 4:8). The apostle Paul describes the battle to take minds captive to the Gospel of Christ. Paul depicted, “casting down imaginations, and every high thing that is exalted against the knowledge of God, and bringing every thought into captivity to the obedience of Christ” (2 Cor 10:3–6). One must think deeply on the things written in Scripture (2 Tim 2:7). What about the compulsive desire that seem to overcome minds? Is there more that can be done? The only way to stop compulsive sins is to make no provision for the flesh. Flesh wages war against one’s spirit. The renewed mind will still be pulled from temptations of the flesh, the eyes, and pride. The Christians must not leave even one path open to temptation. The distortion of desires toward sin can give birth to sin unto spiritual death (Jas 1:14–15). Therefore, “put you on the Lord Jesus Christ, and make no provision for the flesh, to fulfill the lusts thereof” (Rom 13:14). Why would the Scriptures instruct to make no provision for the flesh when it is possible to always withstand sin by setting the mind alone? Therefore, part of setting the mind is to set the mind in making no provision for the flesh. By this, Christians “abstain from every form of evil” (1 Thess 5:22). The need for the renewal of mind shows even greater the need for reinforcement from God and His Church. Christians must pray, read, listen to teaching, sing, and assemble with the saints (1 Cor 14:14–15). Because of the need to continually renew the mind, assembling for edification and worship are essential (Heb 10:24–25). For the assembly is a time of self-examination (1 Cor 11:28–31; 14:40).